Bridging Bionics Foundation's mission is to provide funding, education, and advance the research and development for exoskeletons and bionic technology to augment human mobility and capability. Bridging Bionics Foundation was officially incorporated on March 4, 2013 in the State of Colorado. Bridging Bionics Foundation’s EIN is 46-2182977. Spokesperson and ambassador for a bionic exoskeleton named EksoTM from Ekso Bionics. Over the two-year span, I was responsible for establishing an ambassador program for Ekso Bionics; social media manager; Ekso Hope Director (assisting hospitals and centers seeking funding assistance strategize on how to fundraise). Consultant and Exoskeleton Test Pilot, Berkeley Bionics, Inc.
"I've never stopped dreaming about walking again... I am making my dream my reality one baby step at a time." 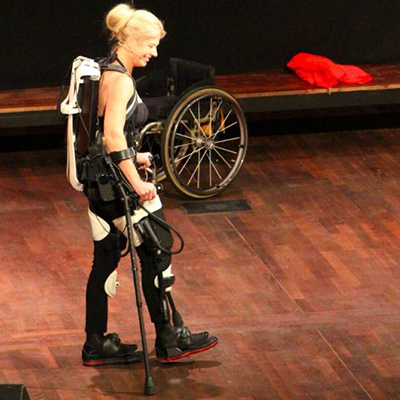 July, 2013 – First person in the US to personally own EksoTM, a bionic exoskeleton suit from Ekso Bionics. This version features a variable assist modality.